The first book in a brand new contemporary fantasy series that is full of magic, hope, and discovering your own path. Lumen will never be like everyone else. Diagnosed with a minor form of schizophrenia at age thirteen, he had all but given up hope that his life was ever going to be more than bullies, doctors visits, and adults that didn't believe him. Because Lumen knew he wasn't sick -- all he saw were panels of light, no voices, or weird thoughts, just light -- but no one believed him. Until he followed the lights and disappeared. There he found a world that lived connected, but invisible to Earth called Bonumalus, the land of the elements Fire, Water, Earth, and Air. It is here that he learns of the connection between the two worlds and that the growing climate trouble on Earth could be fixed here if he is willing to embark on a journey to become an Eague, a master of Water, and stay in Bonumalus. 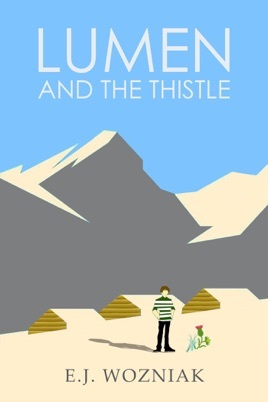 However, there is trouble brewing in this world and Lumen receives several mysterious warnings all with one thing in common -- a thistle, a sign of dangerous things to come. Now Lumen must decide between giving his life to the study of the elements to help Earth fix the climate or join the mysterious group that want the inhabitants of Earth to be punished for what they have done to their world. Lumen and the Thistle is the first book of this intriguing contemporary Young Adult fantasy series that asks readers to think about their part to play in the future of our planet.